Your skin reflects your eating habits. When you eat well, your skin glows, you become indifferent to the needs and skin goes dull. Which is a better scenario? If you agree on the former, then vow today to eat well. This has multiple benefits. Eating well adds to the beauty of your skin and delays aging signs. It goes without saying that some foods actually aid in combating aging factors. These aging factors are the free radicals. Free radicals are formed as a result of various body processes and are in search of gaining stability. If they combine with mitochondrial DNA, the resultant can cause real damage leading to cell death. Now, some foods contain antioxidants, capable of neutralizing free radicals by stabilizing them. Include them in your daily diet. These include foods rich in Vitamin E, Vitamin C and Beta Carotene. Some anti-ageing creams too contain antioxidants. Use them. Vitamin D received from the sun is essential as it helps in assimilating Vitamin A in the human body. But as the saying goes, “Too much of anything is bad”. Excess of sunlight also has its bad consequences. The UV radiation causes damage to collagen and elastin, two most important components of human skin. This results in wrinkling, brown spots besides other aging signs. 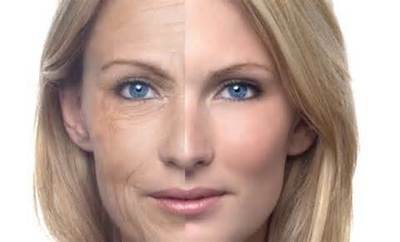 Aging as an aftermath of sun’s rays is referred to as photoageing. Over a period of time, this over exposure to the sun’s harmful rays reduces skin’s ability to produce collagen or replace the lost. Well, to avert this wrath, apply a broad-spectrum sunscreen whenever you step out. Reapply after every 3-4 hours. Additionally, keep your skin as covered as possible. Unfortunately, stress has become an integral part of our lives so much so that people get stressed at its absence in their lives. Chronic stress leads to the non-formation of new cells by affecting telomeres (chromosomes end that allow DNA replication to form new cells). With the breakdown of telomeres, DNA is unable to form new cells and causes cell death. This leads to premature ageing manifesting in the form of wrinkles and saggy eyes. Stress can be thrown out of life by exercising. Exercise is capable of discharging serotonin chemical in the brain that imparts a feeling of happiness and well-being. Besides exercise having a positive outlook towards life, bringing discipline through time management and spending quality time with friends and family are helpful in checking stress (aging factor) from your life. One unhealthy practice that is injurious to the health of your skin is smoking. If you do not smoke, this should not bother you but if you do then, quit smoking. Smoking has deleterious after-effects on the skin. It harms skin’s collagen and elating which are responsible for skins elasticity. Smoking speeds up wrinkling and sagging of skin layers. It hampers oxygen and nutrient transport to the dermal layers. Consequently, cell growth and development is reduced. Smoking face often has pursed lips and lopsided eyes. Over a period of time, it is visible in the form of wrinkles around the eyes and a dull, droopy skin as smoke causes biochemical changes in the skin. Never let the skin dry. Wrinkles make their appearance on dry skin faster than any other type of skin. Drinking plenty of water helps to keep it hydrated from within but a topical application ensures complete protection as environmental conditions too dry out the skin. This can include a vitamin C cream, a good sunscreen, an under-eye cream and an anti-ageing cream. Yes, an anti-ageing cream. Why wait for the aging signs to appear? Start putting your guards right now. Anti-aging cream contains AHA, an ingredient that is known to fend off ageing signs. Market is flooded with such creams but it is immensely important to use a good one. Some good anti-aging creams are Dermology anti-ageing cream, Olay Regenerist, Skinceuticals Ce Ferulic among a host of others. These are some top anti-ageing techniques. Other than these, you should sleep well as your skin repairs and rejuvenates at night, sleep on the back and not on the sides as this increases wrinkles. Follow these techniques and you will have a younger-looking skin for a long time.